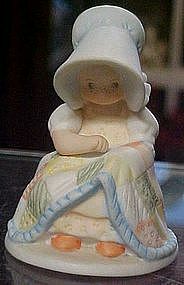 Circle of Friends hand painted bisque figurine by Masterpiece. Titled Whatsoever thy hand findeth to do, do it with thy might. Ecl.9:10. A little girl in a bonnet sits and works diligently on her quilt. Measures3 5/8" tall and is in perfect condition. No box. Perfect gift for the quilter.